Engines Wishlist for Jointed Rail. Thread: Engines Wishlist for Jointed Rail. I may speak for a couple of people when i say some good alco C636, 630's in WNY&P livery. Last edited by M00se; September 25th, 2012 at 09:51 PM. If I can put my ten cents in, JR seems (obviously) to be doing exclusively American (and Canadian) Diesel. So though South African steamers would be awesome, if I may speak for jr, I don't believe it's going to happen anytime soon. If they did steam, it would probably be North American steam (like the big boy, mallet, hudson, mohawk, northern, etc.). So I thought maybe I'd add a few that some probably would never had thought of! 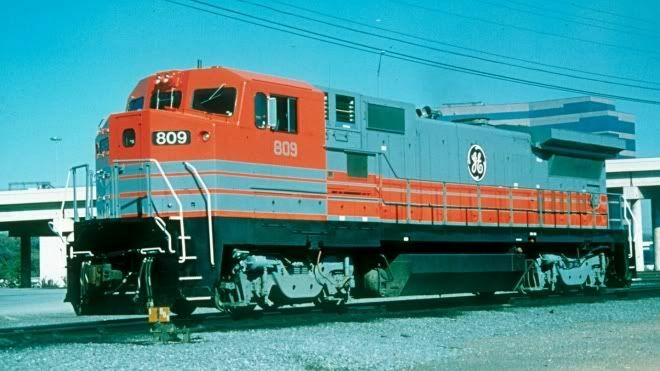 How bout GE's ORIGINAL B40-8W, the B39-8W #809. I KNOW IT IS UGLY..but hey Modern EMD power right? [QUOTE=nathanmallard;1045935]I have to agree with jjanmarine3. South African steamers would be wonderful. Perhaps a 15F class? I have the Red Devil, 34200 diesel and 6E electric unit and a few coaches only . RSA Trainz has quite a few assets progress , excellent quality coming there, I can't wait .... Have you checked out the Trainz Afrikaans thread ? And as always, Have fun! Is that an admiral cab? it said "HTTP1.1 STATUS 403 Remote Access to this object forbidden This file cannot be directly accessed from a remote site, but must be linked through the Brinkster Member's site. " I would like to see locomotives where only the demostrators was the only locomotives of their type produced (i.e. BL20-2) or one that you stays in a small area. Norfolk Southern's Caterpillar-Powered PR43C's, who seem to stay in Alabama, based on recent pictures of them. I would especially like the original three. They look like SD60's that had its radiator section replaced with one from a SD80MAC, SD90MAC SD70ACe and SD70M-2. Only one: Morrison-Knudsen's (now Motive-Power Industries) 5,000hp MK5000C, all six locomotives; both with the original Caterpillar engine and the EMD 645 engines that replaced the original engines which also included replacing the original long hood with the long hood of an Australian-built SD50S. They are now in use on hauling coal trains on the Utah Railway. One more; my favorite railroad rebuild: Santa Fe's CF7's, F units rebuilt into hood locomotives built at the railroad's Cleburne (Texas) shops. They're popular with shortlines now.